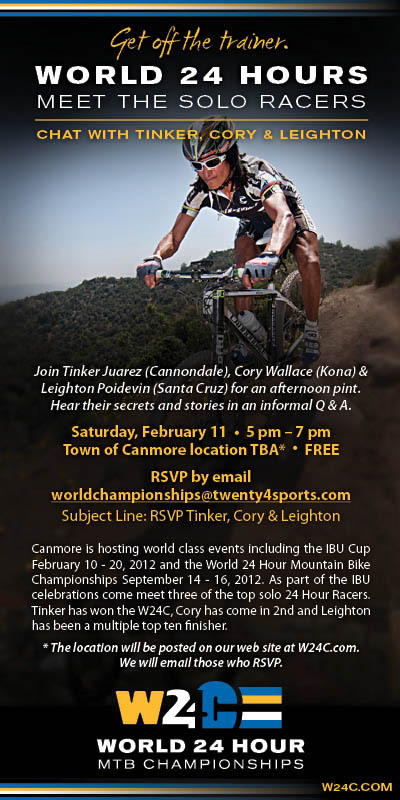 The legendary Tinker Juarez (Cannondale), along with Canadian endurance mountain biker Cory Wallace (Kona) and Santa Cruz's Leighton Poidevin will be in Canmore, Alberta for a meet and greet session on Saturday, February 11th, to help promote the World 24 Hour Championships (September 14-16). The exact location will be announced on the W24C.com closer to the date, but if you e-mail twenty4sports.com (Subject: RSVP Tinker, Cory & Leighton), then you will receive an RSVP invitation to the event. This is your chance to meet some of the top 24 Hour racers, and have a pint with them!